As an alternative to the outdated federal poverty measure, The University of Washington developed the self-sufficiency standard; this standard estimates the amount of income a household of a given size, age and location needs to pay for their necessities without government assistance. Unlike the federal poverty measure, the self-sufficiency standard accounts for living expenses including but not limited to food; transportation, childcare, housing, and taxes are all considered when estimating a proposed income for all of one’s necessities. The standard assumes that all adults work full-time and also considers that many costs differ not only by family size and its structure, but also by the age of children. This developed standard also accounts for costs differences by region which plays a significant role in most budgetary costs, principally housing. This alternative is a much more realistic approach in determining which individuals are to be considered living below a standard of need since household size, age, and location are all accounted for. For example, according to the chart above, the federal poverty measure will consider a household of four that have less than a total of $23,850 pre-tax cash income as impoverished. However, thousands of people living above the poverty line cannot meet their basic needs. 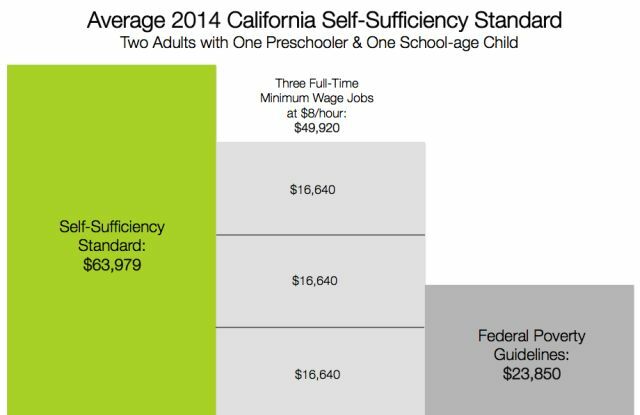 Yet, the self-sufficiency standard will consider a household for more specifically, two adults, one preschooler, and one school aged child that have less than a total of $63,979 of total income in California as living below the standard of need.